This is a good entry point to a unit on phenology. The slides can be used to stimulate participation in student projects in climate change and phenology, to get students collecting data at school or community. Students can be engaged in citizen science projects like "Project Budburst" http://neoninc.org/budburst/. Produced by Citizen Science Central, Cornell Lab of Ornithology; slides are also on the website of the National Phenology Network. Comments from expert scientist: Resource provides several concrete examples of changes likely due to a warming climate that have been documented by interested citizens who were simply taking note of their surroundings over long periods of time. It does so in a fairly simple way, which is easy to understand, and may even inspire people to look around a bit more. All the literature cited is >5 years old. It also presents the warming trend as constant and fairly steep. While that's true at large scales, there isn't any acknowledgement that year to year weather is still variable and so long time periods are required to document species range change due to climate, not just one year. 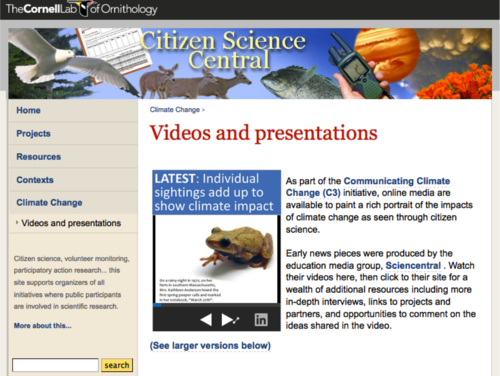 By giving examples of citizen science with a focus on seasonal changes observed in plants and animals, these slide shows will encourage students and other citizens to develop and share their own quality data sets. This is a great opportunity to introduce the concept of Citizen Science to students. The National Phenology Network website has training videos and resource materials on how to become a citizen scientist and gather and contribute data to their database. The slide shows can be expanded for projection in a classroom.